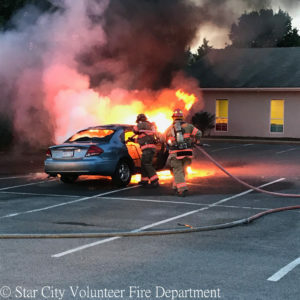 Every year fire departments respond to a large number of automobile fires. Most of these fires could have been prevented if owners had invested a few minutes every couple of months. Steam clean the engine compartment at least every other year. Watch for oil, gasoline or other fluid leaks in the engine compartment. Check all gasoline lines for loose fittings, cracked hoses, bent lines, and worn clamps at least yearly. Have all ‘trouble lights’ that illuminate on your dash investigated and fixed by a service technician. Ensure that the air cleaner is replaced in its original position and is properly secured (lack of proper air to the engine and resulting overheating is a common automobile fire cause). Visually inspect the electrical system for broken or frayed wires and ensure that all wires are making a good connection. This should be done in both the engine and passenger compartments. Never throw any burning material (such as cigarettes) out of a window while driving as the wind may blow it back into the car. Be extremely careful while smoking and/or when using an open flame in or around the vehicle. The older a car gets the greater the importance of maintenance. Remember, if you invest a few minutes of your time today in maintenance, tomorrow you may have prevented a car fire. In the long run, this investment will save you time, money, and a great deal of inconvenience. If you smell smoke or see flames coming from your car while you’re driving, knowing what to do can prevent injuries or even save lives. It’s important to remain calm—but act quickly. Recognize that car fires can break out in places other than the engine compartment. They also can occur under the vehicle, near the wheels and brakes, in your dashboard, and even inside the car. In fact, interior fires can be among the most frightening because of your close proximity to the flames, fumes, and smoke. Signal, and immediately move to the closest safe place to stop, whether that’s a side lane or a median. Get every person out of the car, and don’t allow anyone to go back to retrieve personal items. Alert oncoming traffic if possible and SAFE TO DO SO.